The A1 was previewed at the 2007 Tokyo Motor Show in the form of the Audi metroproject quattro concept car. The concept seats four and features a new plug-in hybrid powertrain. With this powertrain, a 1.4 L (85.4 cu in) 148 bhp (110.4 kW) Turbo FSI engine drives the front wheels via a six-speed S-Tronic, while a 40 bhp (29.8 kW; 40.6 PS) electric motor provides power to the rear wheels. The electric motor is also capable of producing 148 lb⋅ft (201 N⋅m) of torque. The metroproject quattro is able to travel 62 miles (100 km) at up to 62 mph (100 km/h) on one charge of its lithium-ion batteries, which reduces fuel consumption by up to 15%. Both power sources are available to use simultaneously, with the driver then benefiting from MacPherson strut front and rear four-link suspension configuration, electromechanical speed-sensitive power steering with a low energy draw, Audi magnetic ride adaptive damping technology, and 0 to 100 km/h (0 to 62 mph) in 7.8 seconds. The A1 Sportback concept is a five-door hatchback based on the Audi A1 project quattro, with longer body of 3.99 m (157.09 in), 1.4-litre TFSI engine rated at 150 PS (110 kW; 148 hp) at 5,500 rpm and 240 N⋅m (177.01 lb⋅ft) at 1,600-2,400 rpm, S tronic dual-clutch transmission, electric motor rated at 27 PS (20 kW; 27 hp) and 150 N⋅m (110.63 lb⋅ft) driving the front wheels, ESP-controlled active front differential lock, lithium-ion batteries, a two-part spoiler with a striking centre groove integrated into the rear window, Daytona Grey body colour, aerodynamically designed single-frame grille, LED three-dimensional main headlights, turbine-look air vents and air conditioning controls, drive select with dynamic and sport modes, contrasting white and red interior colour scheme, mobile phone WLAN connection, Audi drive select with efficiency mode, MacPherson front suspension and four-link independent rear suspension, 18-inch wheels with 225/35R18 tires, 312 mm (12.28 in) diameter brake discs, electromechanical steering with speed-sensitive power assistance, magneto-rheological shock absorbers from Audi R8 and Audi TT. The vehicle's 0 to 100 km/h (0 to 62 mph) acceleration is 7.9 seconds and average CO2 emissions are given as 92g/km. The vehicle's electric-only range is 50 km (31.07 mi). The vehicle was unveiled at the 2008 Paris Motor Show. The five-door version of Audi A1, called "Sportback" by Audi, was unveiled at the 2011 Tokyo Motor Show. The A1 was produced at Audi's Belgian factory in Forest, near Brussels. The A1 is based on the Volkswagen Group PQ25 platform, the same platform used in the SEAT Ibiza Mk4 and the VW Polo Mk5, and in its development Audi has collaborated with SEAT. The A1 e-tron is a series plug-in hybrid (PHEV), with UQM PowerPhase Select 125 electric motor and controller rated 45 kW (61 PS; 60 bhp) continuous output and peak output of 75 kW (102 PS; 101 bhp). A fully charged 12 kWh lithium-ion battery gives a maximum range of 50 km (31 mi), after which a 254 cc Wankel engine is used to power a 15 kW (20 PS; 20 bhp) generator with a 12 L (2.6 imp gal; 3.2 US gal) fuel tank. This is estimated to provide an additional range of 124 mi (200 km). The company claims the car weighs 1,190 kg (2,624 lb), can reach 62 mph (100 km/h) in 10.2 seconds and a maximum speed of 80 mph (129 km/h). The vehicle was unveiled at the 2010 Geneva Motor Show, followed by the 2012 Taipei Motor Show. Production of A1 e-tron was reported to be cancelled. Available in A1 1.4 TFSI (122PS) and 1.6 TDI (105PS), A1 Competition Line is based on Sport trim (Sports seats, a leather multifunction steering wheel, Driver's Information System) for the UK market, inspired by the famous models from Audi's motorsport heritage, such as the Audi Quattro rally car. It included 18-inch 'Polygon' design alloy wheels, exterior styling package (front spoiler, double-blade roof spoiler, side skirts, rear diffuser in gloss black, stainless steel tailpipe trims), roof line, shoulder line with 'Audi Sport' lettering, number '1' on the bonnet and doors, boot lid, front spoiler lip, side skirts, wheel arch; surrounds and double-blade roof spoiler, rear sills with Audi rings, centre console trim, door handles, floor mats, rear-view mirror trim (not available with auto-dimming mirror), air vent sleeves in high gloss white. It is a version of Audi A1 with a modified version of the Audi RS 3's 2.5 TFSI engine rated at 503 PS (370 kW) at 2500–5300 rpm and 660 N⋅m (486.79 lb⋅ft), tailpipe located on the left flank in front of the rear wheel, six-speed manual transmission and quattro on-demand all-wheel drive from Audi TT RS, 255/30 low-profile tires, 19-inch alloy wheels with unique turbine design, ventilated carbon fiber-ceramic front brake discs with six-piston calipers, rear steel brake discs, Glacier White matt body colour, roof arch in high-gloss black, carbon fiber-reinforced polymer roof, four rings at the front of the car in solid aluminum, single-frame radiator grille with black honeycomb design, headlights with matted clasps with a red 'wing', air outlets in the hood, front fenders and doors and the rear side panels widened by 60 mm (2.36 in) in horizontal "blister" edges (from Audi Ur-quattro), trim strips on the sills are made of exposed CFRP, side mirrors in Audi R8 design, roof spoiler with a double wing, darkly toned rear lights, single closed rear diffuser, rear seat replaced by a crossbar, weight-optimized starter battery in the rear below the two storage compartments, removal of infotainment system and Audi MMI monitor and loudspeaker, CFRP bucket seats from Audi R8 GT, red four-point seat belts, dark gray interior, matt-finished CFRP at the walls in the rear section of the car, the tubes of the air vents and the "stern of the yacht" in the lower section of the center console; CFRP open-spoked sport steering wheel upholstered in leather, rocker switches on the center console replace switches on the control stalk and in the door panels, 3 additional instruments indicate the oil pressure, boost pressure and electrical system voltage; center console and seats covered in fine leather upholstery with tone-on-tone stitching, selector lever is made of aluminum, caps of the pedals and the surface of the footrest made of stainless steel, red loops replacing the handles on the doors, the glove box and the covers of the storage compartments. This car is capable of 0 to 100 km/h (0 to 62 mph) acceleration in 3.7 seconds. The A1 Samurai Blue is a Japanese special ion model based on the 1.4 TFSI (122PS) 3-door unveiled at the 2011 Tokyo Motor Show. It is inspired by the Japanese national soccer team, with red 18-inch wheels with exclusive polygonal design, black interior equipment with contrasting stitching in blue, corresponding colour accents for air vent nozzles, inlays, center console and floor mats; sports suspension. Part of the profit will be donated for Japan Football Association revival fund. A further 111 models were released in 2012. This model is an especial ion in America. This model is known for its prints, striking on the sides, trunk and lateral mirrors (wine color) in addition to its elegant finishes in air conditioning exits, door handles, center console and mats. matching the same prints that surround the car (in wine color). The Audi A1 2012 model features a large engine, the 1.4 liter turbocharged FSI, which generates 122 hp (91 kW) and torque of 200 N⋅m (148 lb⋅ft). This engine can be coupled to two options of gearbox, a S Tronic of 7 speeds, this last one counts in all the versions with pallets of changes behind the steering wheel. Its traction is forward. 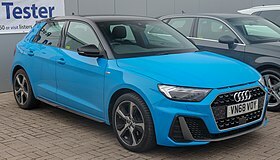 It is a limited (333 units) version of Audi A1 with 2.0 TFSI engine rated at 256 PS (188 kW; 252 hp) at 6000 rpm and 350 N⋅m (258.15 lb⋅ft) at 2500-4500 rpm, six-speed transmission, electronic differential lock, 8.0Jx18 Glacier White cast alloy wheels in exclusive turbine design, 225/35-series tires, 312 mm (12.28 in) diameter front brake discs, black calipers, ESP stabilization program with a sport mode, Glacier White metallic body colour, roof in high-gloss black, frame and grate of the single-frame grille in high-gloss black, curved bars in the headlights – the wings – in red, grille, roof arch and the rear hatch with quattro badges; tinted rear windows, black rear hatch and diffuser, tinted LED rear lights, exhaust system with two polished dual tailpipes on the left and the right, black interior, seats and armrests on the doors are in Silk Nappa leather with contrasting red seams, front S sport seats with bolsters, multi-way adjustment, integrated head restraints and a quattro badge on the backrest covers; lower section of the center console in high-gloss black, footrest and the pedal caps made of brushed stainless steel, red seams floor mat frame, door sill trims with A1 quattro badges, instrument cluster with white needles, red tachometer, quattro logo, color display for the driver information system; leather-wrapped flat bottom multifunction sport steering wheel with contrasting red stitching and the car's serial number, shift lever knob made of aluminum, control elements with aluminum-look finish. Early models include A1 amplified red ion models, followed by amplified white versions shortly afterwards. The vehicle was unveiled in the London 2012 Summer Olympics and was used in the 2012 London Olympic games as shuttles between German House and MS Deutschland cruise ship. Available for A1 and A1 Sportback (1.2 TFSI 86PS, 1.4 TFSI 122PS and 1.6 TDI 105 PS), they are versions of A1 S line for the UK market, with choice of 4 body colours (Ice Silver, Phantom Black, Misano Red or Glacier White colour) with metallic or pearl-effect paint finishes, gloss black finish (3-door) or fully gloss black (Sportback) contrasting roof line, gloss black door mirror housings, xenon headlamps with distinctive LED daytime running lights, Black styling package (a gloss finish for the single frame front grille surround, a matt black finish for the grille, fog light surrounds and number plate holder), 17-inch 'five V-spoke' or no-cost optional 'five-arm' design alloy wheels with a bi-colour finish, interior air vents sleeves in body colour (gloss black for Ice Silver and Phantom Black body colour car), part-leather sports seats, three-spoke S line sports steering wheel. A1 urban racer limited (model ABA-8XCTH) is a limited (150 units) version of right hand drive A1 1.4 TFSI 3-door for Japan market, with increased engine power to 185 PS (136 kW; 182 hp) at 6200 rpm and 250 N⋅m (184.39 lb⋅ft) at 2000-4500 rpm via a supercharger, 7-speed S tronic transmission, matt black single frame grille, bi-xenon package, contrast roof, mirror housing in contrast roof colour, S-line roof spoiler, 18-inch aluminium wheel with exclusive 5-spoke design, black interior, S-line sports seat or leather-wrapped 3-spoke multifunction sport steering wheel with paddle shifter, checker black design floor mat, MMI 3G+navigation, choice of 4 body colours (Daytona Grey, Glacier White, Misano Red, Phantom Black). The A1 competition kits include adhesive film decals, vibrant paint finishes, exterior add-on parts, and a matching interior, available under the Audi Genuine Accessories (AOZ) program. The second generation A1 was launched in mid-June 2018. It is built on the MQB platform which is shared with the Volkswagen Polo Mk6 and the SEAT Ibiza Mk5. Unlike the predecessor, the second generation Audi A1 does not offer diesel engine but instead four petrol variants; The entry-level 25 TFSI (95PS), the 30 TFSI (116PS) with a 1.0 litre three-cylinder engine respectively, the 35 TFSI (150PS) with a 1.5 litre four-cylinder engine and the 40 TFSI (200PS) with a 2.0 litre four-cylinder engine along with 6-speed manual or 7-speed S tronic transmission. The 25 TFSI (95PS) is equipped with a 5-speed manual. MMI radio and Audi smartphone interface which includes Apple CarPlay and Android Auto as standard, as well as a 10.25-inch infotainment touchscreen. In the UK, the trim levels includes; SE, Sport and S line from the previous generation along with three new S Line trims; S Line Competition, S Line Contrast Edition and S Line Style Edition. SE is the base specification, while Sport and S line models includes have sport seats, sports suspension, exterior styling and larger wheels, as well as other features. ^ a b "Where is the Audi A1 produced? SEAT's Martorell car factory". SEAT. Retrieved 16 January 2019. ^ "Audi A1 vs Audi 50". Auto Express. Retrieved 26 February 2011. ^ "New Audi A1 begins to make its mark". www.audi.co.uk. 26 August 2010. Archived from the original on 29 August 2010. Retrieved 31 August 2010. ^ "Audi's five-door A1 unveiled". Autocar. 18 November 2011. Retrieved 20 November 2011. ^ "2007 Tokyo Auto Show Preview: Audi metroproject Quattro". Edmunds Inside Line. 19 October 2007. Archived from the original on 21 October 2007. ^ "Tokyo Motor Show: Audi metroproject quattro concept". 23 October 2007. Retrieved 10 October 2008. ^ "Audi at the AMI in Leipzig: A Spectacular Array of Premiers". Fourtitude. 2 April 2008. Retrieved 22 April 2008. ^ "Audi Design Media Workshop Reveals Brand's Design Creativity". Audi.com.hk. 23 December 2010. Archived from the original on 30 August 2009. Retrieved 1 January 2011. ^ "In Detail: Audi A1 Sportback Concept - Fourtitude.com". fourtitude.com. 2 October 2008. ^ "Paris show: Audi A1". Autocar. 2 October 2008. Archived from the original on 6 October 2008. Retrieved 2 October 2008. ^ "Audi A1 Sportback concept". Audi UK. Archived from the original on 9 October 2008. Retrieved 6 October 2008. ^ "Audi A1 Quattro". Audi. Retrieved 25 December 2011. ^ a b "A1 Engines". Audi UK. Archived from the original on 15 February 2010. Retrieved 24 February 2010. ^ a b c d e "The Audi A1 Pricing and Specification Guide" (PDF). Audi UK. September 2010. Archived (PDF) from the original on 21 August 2010. Retrieved 30 September 2010. ^ a b c "Audi MediaCenter". Audi MediaCenter. ^ "Audi MediaCenter". Audi MediaCenter. ^ "Officially Official: 2011 Audi A1 finally arrives". autoblog.com. ^ "時尚都會小車AUDI A1即將現身，2/26起魅力奔FUN信義區！：AutoNet 汽車日報". www.autonet.com.tw. ^ "魅力奔FUN，AUDI A1信義區〝賽〞時尚！：AutoNet 汽車日報". www.autonet.com.tw. ^ "雙增壓發力，AUDI A1 Sport國內試駕（上）：AutoNet 汽車日報". www.autonet.com.tw. ^ "Audi A1 Targeting Young, Urban Premium Buyers". Liquida.com. Archived from the original on 25 July 2011. Retrieved 1 January 2011. ^ "2010 Audi A1 Test Drive". Popular Mechanics. 18 June 2010. Retrieved 22 January 2011. ^ "A1 Interior style features". www.audi.co.uk. Audi UK. Archived from the original on 14 February 2010. Retrieved 24 February 2010. ^ "Up-tempo Audi A1 ready for Paris show debut". www.audi.co.uk. Audi. 23 September 2010. Archived from the original on 10 October 2010. Retrieved 30 September 2010. ^ "German catalog of A1" (PDF). Archived (PDF) from the original on 22 September 2010. Retrieved 9 September 2010. ^ Sutcliffe, Steve. "Autocar". Haymarket. Retrieved 3 December 2012. ^ "Euro NCAP results for Audi A1 LHD, 3-door Hatchback" (PDF). euroncap.com. 2010. ^ "Audi Gets VW Plant in Belgium, Will Build A1 There". Edmunds Inside Line. 31 May 2007. Archived from the original on 27 September 2007. ^ "Some Audi A1 Details (Correct and Incorrect) from Motor Trend Volkswagen Polo News Story". www.fourtitude.com. 19 January 2009. Retrieved 4 March 2009. ^ Krix, Pia; Krogh, Henning (6 December 2006). "Winterkorn considers jettisoning VW's Spanish brand". Automotive News. Retrieved 1 January 2011. The Spanish company has been deeply involved with the Audi A1's development, as it was with the A3 Sportback. ^ "2011 Audi A1 sells for over $525,000 at auction... and it's pink". autoblog.com. ^ "100,000th Audi A1 rolls off the assembly line". Audi MediaServices. ^ "100,000th Audi A1 rolls off the assembly line - AudiWorld". audiworld.com. 23 June 2011. ^ "UQM Expands Electric Propulsion Offerings to Hybrid Electric Marine Applications through Collaboration with ReGen Nautic". uqm.com. ^ a b c "Audi A1 e-tron Powered by UQM PowerPhase® Electric Drive System Will Wear German Team Colors at London 2012 Summer Olympics". uqm.com. Archived from the original on 22 November 2013. Retrieved 22 November 2013. ^ "Audi A1 e-tron". www.audi.com. Audi AG. Archived from the original on 31 July 2010. Retrieved 5 January 2011. ^ a b "Audi A1 e-tron detail – it's a Wankel-Electric". Cars UK. 10 March 2010. Retrieved 5 January 2011. ^ Ben Pulman (2 March 2010). "Audi A1 E-tron, A8 Hybrid at Geneva motor show 2010". CAR magazine. ^ "通往未來城市的明日之星，AUDI A1 e-tron電動概念車將現身2012台北車展：AutoNet 汽車日報". www.autonet.com.tw. ^ "Audi A1 e-tron: Electric testing has begun in Munich". Germancarblog.com. 10 September 2010. Retrieved 22 January 2011. ^ Ollie Kew and Georg Kacher (5 June 2012). "Audi pulls plug on €40k A2 electric car". CAR magazine. ^ Jim Motavalli (7 June 2012). "In Audi E-tron Program, Pure Electrics Surrender Some Charge to Plug-in Hybrids". The New York Times Wheels blog. ^ Mike Szostech. "Audi Expands testing of A1 E-tron". My Electric Car Forums. Retrieved 3 April 2013. ^ "Car News, Reviews, & Pricing for Environmentally-Friendly Vehicles - Autoblog Green". Autoblog. ^ "A1 Editions (May 2011)" (PDF). audi.co.uk. Archived from the original (PDF) on 26 November 2012. Retrieved 20 November 2013. ^ "Introducing A1 Editions". www.audi.co.uk. Audi. Archived from the original on 3 September 2011. Retrieved 17 October 2011. ^ "503PS Audi A1 clubsport quattro wows Worthersee 2011". www.audi.co.uk. Audi. 31 May 2011. Archived from the original on 6 April 2012. Retrieved 1 June 2011. ^ "Audi unveils 500hp A1 Clubsport Quattro show car at Wörthersee". autoblog.com. ^ a b "Audi at "Wörthersee Tour 2011"". audi-mediaservices.com. ^ "2012 Audi A1 Contrast And Black Edition Review @ Top Speed". topspeed.com. ^ "Audi UK reveals new A1 special ion packages". quattroholic.com. ^ "AutoNet 汽車日報：AUDI A1 Black Edition限量40部時尚有型登場！". www.autonet.com.tw. ^ "Audi Gets Charitable In Tokyo With A1 Samurai Blue". motorauthority.com. ^ "Audi creates limited ion, 252-hp A1 Quattro". autoblog.com. ^ "AutoNet 汽車日報：趕搭奧運熱潮、展現愛國情操，AUDI推出A1 e-tron特仕版為德國隊加油". www.autonet.com.tw. ^ "A1 e-tron At The Olympics - HybridCars.com". hybridcars.com. 1 August 2012. ^ Tutu, Andrei (1 August 2012). "2012 London Olympics Theme for Audi A1 e-Tron". autoevolution.com. ^ "404 - stupidDOPE.com". stupiddope.com. ^ "Huffer stamps its mark on 15 Audis". idealog.co.nz. 26 November 2012. ^ "Audi A1 China Limited Edition setting limit to 500 for sale over the world". audi.com. ^ "404错误页面 > Error pages > Navigation > 一汽-大众奥迪官网>突破科技 启迪未来" (PDF). www.audi.cn. ^ "The only 500 units, the Audi A1 China Limited Edition". cnautoblog.appspot.com. ^ "Errors - 日刊工業新聞 電子版". www.nikkan.co.jp. ^ "AutoNet 汽車日報 [about CAR you should know]". www.autonet.com.tw. ^ "Not Found(404) > Error pages > Navigation > アウディジャパン". www.audi.co.jp. ^ "Audi A1 Sportback 'S line Competition' Limited Edition Arrives in Australia - Fourtitude.com". fourtitude.com. 3 July 2013. ^ "AutoNet 汽車日報：極致魅力 精彩展現！台灣奧迪推出AUDI A1時尚限量版/傳奇競速版特仕車款". www.autonet.com.tw. ^ "Audi's A1 S line Style Edition makes the MINI look cheap - SkiddMark". skiddmark.com. 16 July 2013. ^ "Audi A1 S line Style Edition Paints the Town Red, White, Silver & Black - Fourtitude.com". fourtitude.com. 16 July 2013. ^ "アウディ、「A1」・「A1 Sportback」それぞれの特別仕様車を発売 - エキサイトニュース". excite.co.jp. ^ "Audi A1 competition kit". www.fourtitude.com. ^ "Audi A1 e-tron wins Silvretta Electric Car Rally". autoblog.com. ^ "What Car? Car of the Year awards 2011 – Supermini winner". whatcar.com. 13 January 2011. Retrieved 11 February 2011. ^ "Justin Timberlake named new Audi "brand ambassador"". autoblog.com. ^ "Audi Space on Playstation Home shows off A1, lets you race E-Tron". autoblog.com. ^ "Free Audi A1 Beat Driver App updated!". iPhoneLife.com. ^ "Audi A1 Beat Driver App Comes Exclusively to the Apple iPad". marketwired.com. ^ "Justin Timberlake & Audi A1 Mini Series – Ep 1". YouTube. Retrieved 20 July 2010. ^ "阮經天任AUDI 2011年度台灣區品牌大使，A1上市記者會首度曝光！：AutoNet 汽車日報". www.autonet.com.tw. ^ Dobra, Andrei. "Need for Speed World Reaches 5 Million Users, Gives Out Free Audi A1". softpedia.com. ^ "Audi A1 Club Sport Quattro code. - MPGH - MultiPlayer Game Hacking & Cheats". www.mpgh.net. ^ "Audi A1 Club Sport Quattro for FREE in NFS World - ISRC 2 :: Message Board". isrc2.proboards.com. ^ Need For Speed World Free redeem code. ^ "NFS World: Audi A1 clubsport quattro - Speed Edition". nfsplanet.com. ^ "Audi A1 iPad e-Catalogue (Audi A1 eKatalog)". shelf3d.com. ^ "最新宣傳管道，AUDI推出A1專屬APPLE iPad電子型錄：AutoNet 汽車日報". www.autonet.com.tw. ^ "EAT - Everybody All Together - Freelancer Network Archive » AUDI A1 eCatalogue". everybodyalltogether.com. ^ a b Garnsey, Steve (10 October 2018). "VW Group highlights gains from making Audi A1 in Spain". Automotive Logistics. Retrieved 18 January 2019. ^ Sheehan, Sam (18 June 2018). "2018 Audi A1 makes first public appearance at Paris motor show | Autocar". www.autocar.co.uk. Retrieved 19 January 2019. ^ a b "Sideview > Audi A1 Sportback > A1 > Audi configurator UK". www.uk.audi.com. Retrieved 18 January 2019. ^ a b "Frontview and Rearview > Sideview > Audi A1 Sportback > A1 > Audi configurator UK". www.uk.audi.com. Retrieved 18 January 2019. ^ Huntingford, Steve (18 June 2018). "2019 Audi A1 revealed – price, specs and release date". Retrieved 18 January 2019. ^ Burn, Jonathan; Wilkinson, Luke (22 November 2018). "New 2018 Audi A1 Sportback: pricing and specification details". Auto Express. Retrieved 18 January 2019. ^ "Antrieb > A1 Sportback > A1 > Audi Deutschland". www.audi.de. Retrieved 18 January 2019. ^ "A1 | Audi UK". www.audi.co.uk. Retrieved 18 January 2019. ^ "Trim > Audi A1 Sportback > A1 > Audi configurator UK". www.uk.audi.com. Retrieved 19 January 2019. Wikimedia Commons has media related to Audi A1.